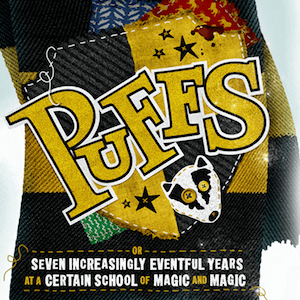 Puffs, or: Seven Increasingly Eventful Years at a Certain School of Magic & Magic gives you a front row seat to the sidelines of the world’s most famous magical journey. Named one of Hypable’s top five plays of 2015, Puffs “exudes a jovial, winking fondness for all things Harry” (The New York Times) as it follows the story of a young wizard named Wayne Hopkins and the Puffs–a group of well-meaning, loyal rejects with a thing for badgers. Together, they do their best to learn spells, try not to get hurt, and discover what they’re really made of…but, seriously, try not to get hurt…in this “laugh-out-loud production perfect for any fan of this magical world” (Pop City Life). A fun evening for Harry Potter fans!!! If you read the Harry Potter books or enjoyed the films, this show is a must see! Ever wondered what the other houses were up too? Then go see Puffs!!! Funny and entertaining.